While we’re still rejoicing at the birth of Bill and Kelly’s son, Mason, we had our very own baby yesterday. 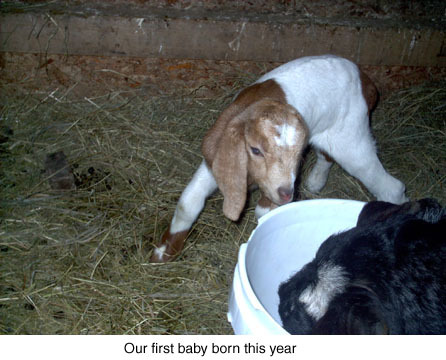 Okay, so it’s a baby goat, but hey, it’s the best I can do! Actually, she was not expected until the end of the month, so she was a total surprise. So when I had nightmares about generators and our friend Tom suggested we buy a new Honda generator (brushless), I decided I’d better do it, even if they were $$$$$$. Ouch. So while all this was going on, I went out to do chores and missed our black and white Nubian doe, Luna, at the feeding trough. Oh oh. Yep, I went inside and she was getting ready to give birth. I watched and soon a head popped out, but the feet were over the head. Not the normal birth presentation. I still waited and waited. Nothing. So I hauled bales of hay to the gate which David had SCREWED shut after they’d gotten out recently, climbed in the pen and delivered the kid. A DOE!!! I’ve been waiting for a doe from Luna for years and here she is. Today she’s up and frisky. And we’re using the new Honda generator. Pretty soon I’ll need a license or something because we have 6 generators in various states of repair. Actually, 5 work. Usually! Sigh. Life was so much easier without all the technology! But we’ll get it whipped yet. And I’ve got a nice mini-vacation coming up….the first in years. Can I freeze the eggs? I am the happy owner of 20 beautiful hens and 2 dashing roosters. My question is this, is there a way to longterm store the eggs? Can I freeze them in anyway? Also, what is the breeding and gestation time for hens. My roosters are breeding now and I would rather the hens not go broody until warmer weather. Could you help shed some lite? Love your magazine. Thanks! Yes, you can freeze eggs. Most folks just break the eggs, several at a time, into small plastic freeezer boxes. You want enough eggs to just about fill the box, leaving room for expansion during freezing but not enough space to let a lot of air contact the eggs. You can leave them whole or mix the whites and yolks. found that it will, in time, dissipate, but nothing to say how long. Do you have any information about this? Could you please help me find an old fashioned cold ketchup recipe using tomatoes and horseradish? I want to surprise my mom with a “gift from the past” as she used to get a jar from my great grandmother every year for Christmas in a basket of homemade goodies. She says it is wonderful with fried potatoes. I’ll give you what I’ve got and hope it’s what your mother remembers! Jackie we love you! I got a new pressure canner not too long ago. We have very heavy water and the canner is aluminum. Can I add some vinegar to the water in the canner to stop the scale? Also, I have been looking for a salami recipe. Yrs ago I able to eat home made salami an old family made and processed in the basement. It was so wonderful. Yes, you can add a little vinegar to your canner. But you probably would find it easier to just use some soft water, such as rainwater, spring water or water from a friend’s house for your pressure canning, as you really don’t use too much at a time. Here’s a salami recipe, although you’ll find dozens of other ones, as well, like you do any other recipe. This one is modernized, instead of using casings, you just use aluminum foil. Divide into 3 long rolls and wrap each in heavy foil and fold tightly closed down the center and on ends. Refrigerate for 24 hours. With a fork, poke small holes on bottom of rolls. Place foil wrapped rolls on broiler rack, on broiler pan half filled with hot water, in center of oven. Bake at 350 degrees for 1 1/2 to 2 hours. Remove foil. Set rolls on rack to drain and cool. You may smoke at this point or not if you used liquid smoke. The smoking darkens the product and dries it to the familiar dry texture you’re probably familiar with. Canning the pintos is just a starting point. You can either add spices, such as chili powder or even taco flavored granules, peppers, onions or whatever you want to your canned beans or else add them when you cook them. I use my canned pintos for refried beans and when I mash and fry them, I dice some onion, chop some chiles, add some other spices and I have good tasting frijoles….not the bland store ones! I’m excited for you and your plans. The best of luck and keep us posted! I was wondering if you knew of anything that could make my home-canned pinto beans have more flavor? I have canned them with a tablespoon of salt and then I tried a piece of salt pork. I end up with a very bland tasting beans with no flavor at all. I also wanted to say that I really love your blog. It is so much fun to read and I learn a lot from it. I have a 2 year old and 3 year old son and I have decided to raise them on a farm. My wife was never around any farm animals so she is as excited as the boys are to see the new animals we purchase. We are also raising and canning our own vegetables. I wanted to say I have a lot of admiration for you. Hooray for Luna and her baby! What are you going to name her? And are Nubians your favorites? I fantasize about having a pair of does on my little one-acre Eden, and would like to milk them, but I figure Nigerian dwarfs are about the only ones I’d have room for. I hear that they’re good milkers, but don’t know how you’d milk a goat the size of a spaniel! I sympathize with your generator issues (especially since my furnace just *stopped* last night, shriek); I keep thinking I should get a propane generator as backup. It’s on my wish list! Most of all, keep us posted on the Washington trip. I hope your guy’s as wonderful in person as he is at a distance!! !